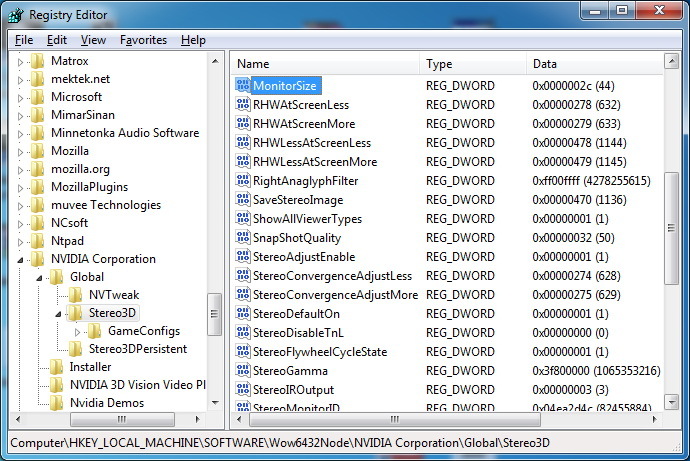 You should know however that the 3D Vision driver resets the value in the registry called MonitorSize to its default settings and with some of the older drivers the method described below did not work. The good news is that with the latest 3D Vision Driver CD 1.27 and the drivers version 257.15 this workaround is working again, so if you need more depth you can easily get it. But when you run a game with 3D Vision the MonitorSize value gets reset, so the actual workaround is modifying it after it has been reset. Depending on the windows type you are using – 2-bit or 64-bit version the place where you can find the required value in the registry you need to modify is different. The value MonitorSize in the image above represents the normal number for a 22-inch Samsung 2233RZ monitor. You can see that the value in HEX is 2C or in decimal numbers 44, which is double the size of the monitor and there is very clear reason for that. Each number from the value 44 represents half an inch size, so that is why 44 actually represents a 22-inch monitor size with the idea that when you can change the size in half of inch you get better control than with 1 inch. So what you need to do in order to increase the maximum depth level is to actually decrease the size of the monitor, if you for example set it to 22 decimal (16 HEX) value this will mean that you have 11-inch display and you’ll get double the depth (100% more). So after this modification when you movie the slider for depth with one percent it will actually increase twice the depth than previously, but the scale for depth percentage will still remain up to 100% (it will not increase to 200%). 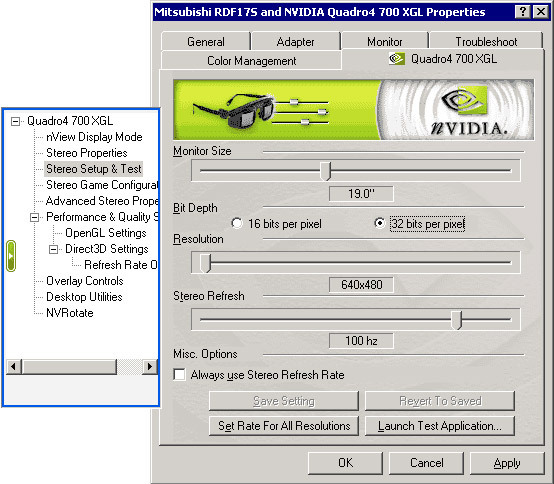 The same can be applied in reverse in order for you to have lower depth level and finer control by increasing the monitor size, with 88 decimal number or 58 HEX you’ll get half the depth level than normally, but still with a scale of up to 100%. And since you probably will not need to have more depth in each and every game, you may want to have higher depth levels in some games and lower in others, so you can get some automation for each game with the help of Batch files. The following example batch files will run the game Tomb Raider Underworld, wait for 3 seconds and then modify the value of MonitorSize in the registry to 11-inch display instead of 22-inch, effectively doubling the available depth levels in the game. You can save the example files (separate versions for 32-bit and 64-bit OS) with the name of the game to easily identify them like TRU.bat for for Tomb Raider Underworld, just don’t forget to edit the second line of the Batch file to point to the path and the executable file of the game you want to run. Note that here the value you set for MonitorSize (22 in the example) is in decimal not HEX numbers, so it is 22 instead of 16 (16 HEX equals the decimal number 22). Wow! Fantastic! Finally games like Batman AA and Assassins Creed II have a great depth. Thanks for this! Probally the best tip! Rodrigo, I am playing Batman AA on an Alienware OptX AW2310 3D monitor and i think Batman AA looks incredible to begin with. Does the information in the article above really make Batman AA look that much better? Yeah, by default Batman AA is very good in S3D (100% depth), with a good depth. But with this trick the depth is even better, much better. Test by yourself, really works! With a little of convergence the result is just amazing! Assassins Creed 2 is absolutely fantastick with 200% depth. Just incredible! Love this trick! Rodrigo, I noticed that in Batman AA and in the Resident Evil 5 3D benchmark video if I turn the 3D depth wheel on the receiver to 100% I notice a large amount of ghosting. I usually leave the 3D depth at about less than halfway or a quarter of the way. I have the Alienware OptX AW2310 3D monitor. I could only imagine that making the depth even more intense would cause a lot more ghosting. Do you know how I can get rid of that or greatly reduce it? I have played Assassins Creed 2 on Ps3 however I would consider playing it again with the 3D vision due to the fact that everyone is saying it looks so good, which I did not even think was possible. Does AC2 have controller support? I have the ACER 3D Projector and been wondering the same thing as I’ve seen more depth on smaller 3D LCD monitors but not as impressive on my 200″ screen. I was even considering to sell my projector for that reason! But maybe i dont have to.. But.. Im confused on how to set up the depth number when using my projector. Let me know what number should I put to get a good depth from projecting on my large screen. The above example is increasing depth on a 22″ screen.. so So thats why im confused. Let me get this right for a 22 monitor its set to 44, so change to 22. So if im projecting 220″ change it to 110? The above example with 44 to 22 change will double the depth level you get with each step with a 22-inch monitor. Os you should check the registry to see what is the number shown fro your projector, setting a value that is half that of the projector size will give you double the depth level with each step. However the value will most likely not be 220 as the driver doe snot know what size of the projection you are getting, it may be some general value set for all projectors. So try reducing the value to half of its original value and please post what is the value you actually have in the registry. Can’t believe I missed this the first time around, the effect is incredible! Wonderful for a projector! Thanks!